At McKeefry Dental we offer the latest in orthodontic services with Invisalign® clear braces. With Invisalign® you simply insert and wear a set of clear plastic aligners over a period of time. By progressing through your sets of customised invisible aligners, your teeth continue to move and straighten into position. It’s that simple and that easy. Invisalign® gradually moves your teeth using a series of custom-made, removable braces. At the start of your treatment we can show you, with our 3-D computer imaging technology your predicted new look. That way, you can get a clear impression of the likely end result, and your improved new smile! What's more, through straightening your teeth you can make a significant difference to having a healthier mouth and keeping your teeth for life. Teeth not properly aligned in your mouth can lead to periodontal disease and create abnormal amounts of stress on teeth and jaws. Be assured, with Invisalign® you are not only improving the look of your teeth; you are also improving the long-term life and health of your teeth. All important steps in maintaining your long-term dental health and appearance. then Invisalign® may be the ideal solution for you. Depending on your particular case, McKeefry Dental can determine if the Invisalign® treatment programme is appropriate for you. Clear aligners that are virtually invisible. Easy removal of the aligner - making it easy for you to remove when you eat, and when you clean your teeth. Greater comfort – with Invisalign® there are no metal braces and wires. No need for regular adjustment to metal braces – with Invisalign® you simply move up to the next aligner in the series. You can view your own virtual treatment plan before you start - with Invisalign® you can visualise how your straight teeth will look when the treatment is complete. A more aesthetic approach – Invisalign® aligners are made of thin, discrete and transparent plastic. The ultimate choice for many! 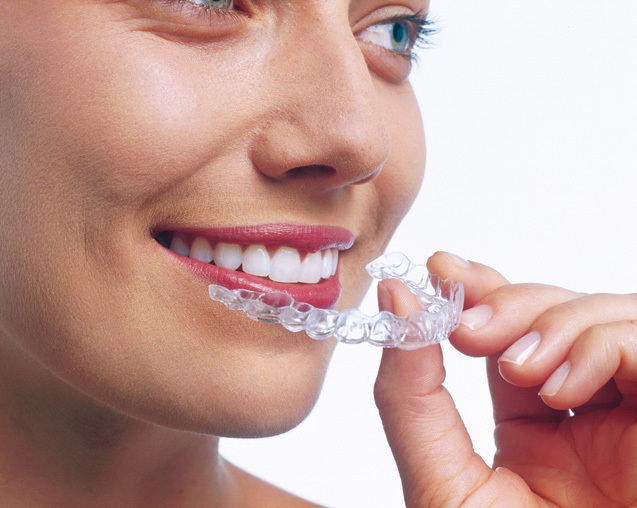 Invisalign® offers the latest approach for wearing clear invisible braces. At McKeefry Dental a Trios Scanner is used during the planning stages of your Invisalign® treatment. This scanner quickly, easily and comfortably takes a digital impression of your teeth, eliminating the need for messy impressions. Your digital impressions will then get emailed directly to Invisalign® in the United States - instead of being posted. Compared with traditional impressions the Trios Scanner can drastically speed up the initial stages of your Invisalign® treatment. This includes an initial 15 minute consultation, which is complimentary, to discuss your alignment requirements and any other relevant treatment issues. In this session we will discuss with you your treatment options including the suitability of using the Invisalign® clear braces. Once you are comfortable with the proposed plan, we will progress with taking dental records including photographs, scans of the teeth and skull x-rays. 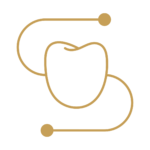 This is necessary to ensure we fully understand all aspects relating to your teeth and their positioning.This information is also necessary for developing your set of clear customised aligners. Approximately one month later we will schedule an appointment with you. In this viewing session we can show you a virtual digital show of how your teeth and smile will progress over the treatment period. That way you get to view the proposed path as you progress through the treatment. It also gives you the opportunity to ask any more specific questions about your Invisalign® treatment. After you have approved that you want to move forward with treatment, we arrange for your customised aligners to be manufactured. This is completed offsite by a specialised Invisalign® technician. When we receive your aligners, we arrange an appointment for your first fitting. This is the first in a series of fittings. Approximately every 6 weeks you return and are fitted with your next progressive aligner. Once your initial aligner is fitted, it’s important that you wear each aligner for 22 hours a day. This is critical to the success of the Invisalign® treatment. Early on in the treatment, we also may bond a small tooth coloured fitting to your teeth to further support the realignment process. These tooth fittings are small and tooth coloured to ensure minimum visibility. Throughout the treatment period, we also may slightly recontour your teeth to improve their shape and gain spacing if required. Once you have completed wearing the full set of Invisalign® aligners we will review your teeth realignment results. In most cases the predicted results will closely mirror your new beautiful smile. However, if we feel further work is required we will discuss this with you, and proceed with a revised treatment plan to address any remaining areas of concern. The very final step is fitting a retainer option for you to wear (often just a night-time retainer) to ensure you retain your beautiful new smile. Download our Getting Started With Invisalign® document here. Click here to book your free Invisalign® consultation today. about our your suitability for Invisalign® please Contact Us. Download our Packages Information document here. Invisalign® uses 3-D computer imaging technology to depict the complete treatment plan from the initial position to the final desired position from which a series of custom-made “aligners” are produced. Each aligner moves teeth incrementally and is worn for about two weeks, then replaced by the next in the series until the final desired position is achieved. Aligners are made of clear, strong medical grade non-toxic plastic that is virtually invisible when worn. The length of treatment is dependent on the severity of each individual patient’s orthodontic issues. Treatment may vary from anywhere between 6 months to 2 1/2 years with an average treatment taking around 12 to 14 months. Like brackets and arch wires, the Invisalign® aligner moves teeth through the appropriate placement of controlled force on the teeth. The principal difference is that Invisalign® not only controls forces, but also controls the timing of the force application. With each aligner, only certain teeth are allowed to move, and these movements are determined by the orthodontic treatment plan for that particular aligner. This results in an efficient force delivery system. Will there be an initial consultation fee? At McKeefry Dental, prior to commencing with the Invisalign® approach, we hold an initial on-site consultation. This appointment is free and usually takes just 15 minutes. For more information about our initial complimentary consultation click here. Is there a price reduction if I only require the top/bottom aligner? The charge for Invisalign® is based upon the consultations needed and the 3-D modelling cost. Whether your treatment requires one arch or two arches (i.e. treatment to your top and bottom teeth) the price will be virtually the same. What are Invisalign® i7 and Invisalign® Lite? Invisalign® i7 and Invisalign® Lite may be appropriate for people who require only minor corrections of their teeth. This can be determined after the initial set of records are taken. No. Unlike traditional orthodontics, you can usually eat whatever you desire while in treatment because you remove your aligners to eat and drink. Thus, there is no need to restrict your consumption of any of your favourite foods and snacks, unless instructed otherwise. Also, it is important that you brush your teeth after each meal and prior to reinserting your aligners to maintain proper hygiene. Can I drink with aligners still on? You should remove your aligners to drink anything else except cold water. Leaving aligners on while drinking may stain them; risk tooth decay if you drink fluids containing sugar; and if you are drinking just clean hot water, you may warp the aligners. We discourage smoking while wearing aligners because it is possible for the aligners to become discoloured. The best way to clean your aligners is by brushing and rinsing them in lukewarm water. We can also supply you with aligner cleaning tablets which are available to purchase. Alternatively, you can also simply soak them in white vinegar diluted with water. Your aligners/dental braces should be worn all day, except when eating, brushing and flossing. It’s important that you wear each aligner for 22 hours a day as this is critical to the success of the Invisalign® treatment.